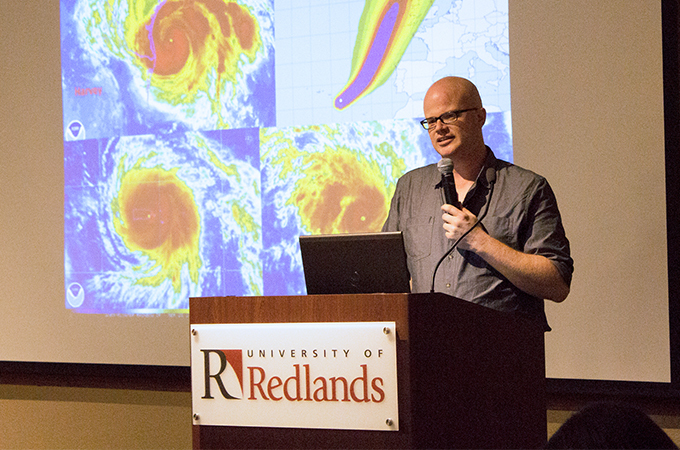 Members of the University of Redlands community gathered October 17 to hear Dr. Andrew Schroeder, a founder of WeRobotics and director of research and analysis for Direct Relief, talk about tapping the potential of spatial technology for disaster relief. Schroeder—who has engaged in disaster relief operations in Myanmar, Haiti, Liberia, and New York City, and has contributed to global health projects in the Philippines, Ethiopia, and California—began with a summary of natural disasters over the past decade and how geographic information systems (GIS) and other technologies have begun to help vulnerable populations. After being hired by Direct Relief in 2008, Schroeder began investigating the ways in which maps can be used to help regions affected by natural disasters. By mapping a country’s health infrastructure, such as clinic and hospital locations, he learned that aid resources could be mobilized more efficiently in times of crisis. After the earthquakes in Haiti and Nepal, drones and medical personnel were able to deliver supplies to heavily damaged areas because the country’s health centers and densely populated areas had been previously mapped. After discovering the importance of drones and mapping in humanitarian relief, Schroeder founded WeRobotics and began working to build a global network of innovation labs that allow local communities to use robotics for social good. Currently, WeRobotics is concentrating efforts in Peru, Tanzania, and Nepal. The recent talk was part of the Center for Business GIS and Spatial Analysis (GISAB) Speaker Series. Next up in the series is “Space Time Pattern Mining: A New Frontier in Spatial Analysis” by Esri’s Spatial Analysis Product Engineer Lauren Bennett on Tuesday, November 14, from 5:30 to 7:30 pm. (dinner at 5:30 p.m.; lecture at 6 p.m.), at the University of Redlands main campus, University Club. Please R.S.V.P. to Christine Mee at gisab@redlands.edu.